Tis the season for White Christmas Cupcakes. Though in the Seattle area, we are more accustomed to wet holidays than the white variety… which I'm absolutely not complaining about, since my car readily doubles as a sled when there is so much as a blush of frost on the ground. I'll take frosty christmas cupcakes over the real thing any day. More so today, since I was having a raging pregnancy sugar craving. While the desire for sweets was strong, the desire to actually do the work to produce them was not. Today I needed something tasty, easy and bloggable. "Ready made pie crust + instant pudding"
Now, I can be persnickety about how things are done in the kitchen, but I'm really not overly dogmatic about baking. Cooking is a joy but sometimes we need to... well, expedite things a little. We have days where we are tired, pregnant, busy, or just want cram sweet desserts into our faces in under an hour. That's when I pull out the cake mix. It happens. While many things are best done from scratch, I have few qualms about using cake mix when making ordinary cupcakes. Sure, I have dozens of recipes for white cupcakes, including those from the likes of Thomas Keller, and I am quite capable of making them. Sometimes though, you just don't want to spend two hours in the kitchen cooking from scratch. That time is better spent doing laundry… or eating half a dozen cupcakes. The only thing that would prompt me to start advocating the creation of desserts on par with the previous cake, is a radical lobotomy. CornNuts™ sprinkled over fresh-from-the-jar frosting is an abomination. Using the occasional box mix as a short cut to cupcakes is not. Those are the rules …that I just wrote. adapted from The Cupcake Deck, a rather cute little collection of recipe cards stuffed into Ms. H's stocking a few years ago. 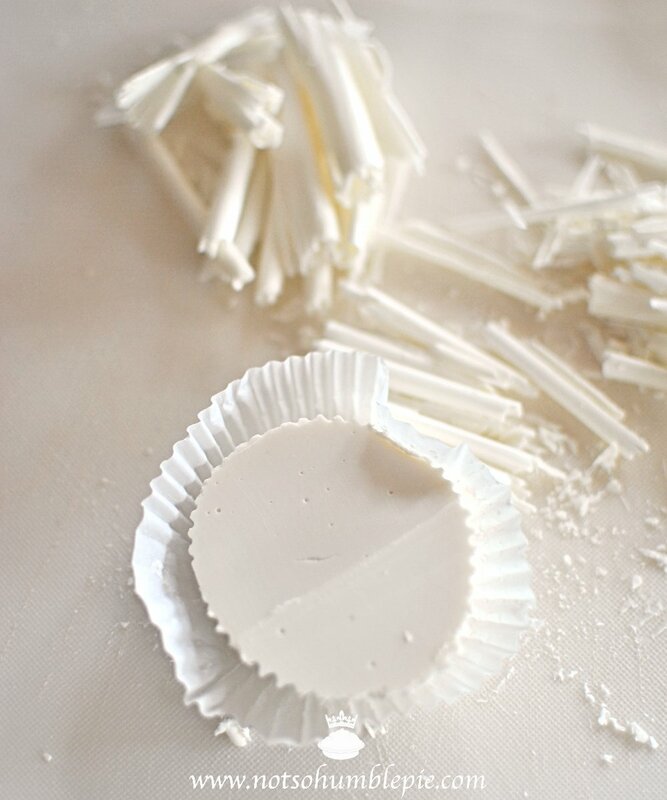 Gently melt the white chocolate over a double boiler, stirring until smooth. Set the chocolate aside to cool until just barely warm. Combine the white chocolate, butter, vanilla and cream cheese in the bowl of your mixer and beat until smooth. (It is important that the butter and cream cheese are at room temperature, as any chill will result in the chocolate hardening and creating a grainy or lumpy frosting.) Add the powdered sugar and beat on medium speed until smooth. To make perfect chocolate curls you need a sharp knife, a sturdy block of chocolate and a little warmth. Warm the surface of the chocolate block briefly with your hand (protected with a piece of cling wrap) and then shave the block with your knife to remove a curls (repeat). If the chocolate is slightly warm it is easier to produce sturdy curls. If the chocolate is too cool, shaving it with a knife will only produce brittle chocolate shavings. Pipe or spread the frosting onto the cupcake, top with white chocolate curls and dust with a sprinkling of powdered sugar. I love it! for sure, I will make it! Beautiful finishing touches. I bet they tasted as good as they looked! Good lord that Kwanzaa cake looks vile! Ugh... Your cupcakes are quite lovely though! I'm excited to try out your frosting recipe. Yum! I am with you! When you are pressed for time, energy and want to spend more time on other things. I love a good box cake. A few teaks and you can have a scrumptious cupcake! BRAVO! this post got me thinking…i recently had a big disaster of a failed, very time consuming recipe…so i would agree that... yes,it is justified to bake from a cake box mix when time or inclination is limited…infusing ones decorations to take the box mix up several notches is just a great way of turning the ordinary into something wonderful as you have done….the cupcakes look delicious & your photography is great! ps: don't get me started on sl & her recipes & "scapes"…scary. That God-awful Kwanzaa cake cracks me up, what a HORRIBLE thing to call 'dessert.' So glad you're feeling a bit better and you're back in the kitchen...these cupcakes look delicious! That Kwanzaa cake is an abomination. None of those things sound good when they're all put together. I don't know how Sandra Lee's actually considered a "cook" or a "baker" if she puts something like that together...she's more of an interior decorator, and a scary one at that. 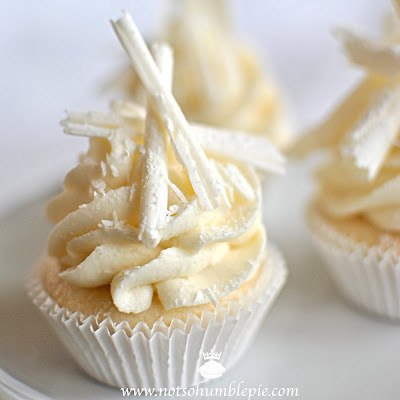 My ranting aside, those white chocolate cupcakes look gorgeous! If we didn't already have tons of sweets around our house thanks to holiday baking, I'd love to make some this week! these are way to fabulous looking to eat! happy holidays! CornNuts is only the first of many things wrong with that cake. Yikes. But, your cupcakes look amazing, and as always, your photography is beautiful. Thanks for the tip about making the chocolate curls. I've never had much success with those. 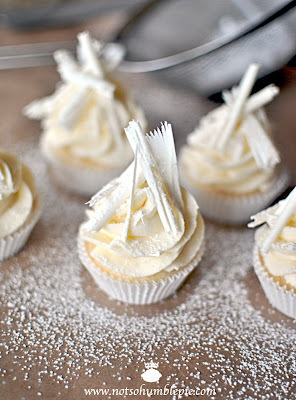 Beautiful winter wonderland cupcakes and I definitely know what you mean about needing dessert stat! Wow. Sandra Lee was actually going to eat that cake? These look delicate and beautiful. Lovely idea for a holiday cupcake. These cupcakes look amazing! :) So christmassy. Lovely Lovely, gorgeous..did I mention lovely. I once saw Sandra Lee microwave a hot dog, and say, "Wow! Look how easy cooking can be!" I almost died right then. I have never heard of Sandra Lee before but I now know to avoid all of her recipes. That recipe is beyond ridiculous! What a great tip for making chocolate curls. I can't wait to try it out. Oh Wow! This are so lovely!!! Everything you make is too pretty. I think you could just boil water and make it pretty. I've generally snubbed box mixes despite only being a a mediocre baker but the other day, a little boy gave me some chocolate chip cookies he'd made from a Betty Crocker mix and I have to say they were really good. Where has Betty Crocker been all my life! I ate about a dozen of them and I have since been eyeing Betty Crocker at the supermarket. Her chocolate chips are bigger than any I've come across. I never knew boxed could taste so good. Those truffles are absolutely mind boggling! That's like trying to make meringues out of cool whip and powdered sugar. As always, everything looks so beautiful and tasty! Sandra Lee makes me sad. She is the antithesis of what it means to create food with love; and anyone who cares even an iota about what they feed themselves and their families knows that's what food is about. Your cupcakes, though - they make me happy. :o) When are you due?? Hope you're feeling better! These are pure gorgeousness!! So snowy, perfect for the Xmas dinner or New Years party! Ohhh my gosh!! as always I am so impressed this is gorgeous!!!!!!!! I'm thinking about making these for new years eve! I still have some questions about the recipe: How much grams is a stick of butter? And how much grams is a cup of powdered sugar? And do you think I can combine the frosting with champagne, or will the texture go all weird? VERY COOL! Glad I found your blog!! Those cupcakes look so cute (and delicious)! And they look so classy too. That Kwanzaa cake though... I think it might give me nightmares. Happy New Year to you and the humble family! Nothing wrong with the occasional box, especially if the end results look as gorgeous as these. Good luck with the rest of the pregnancy. 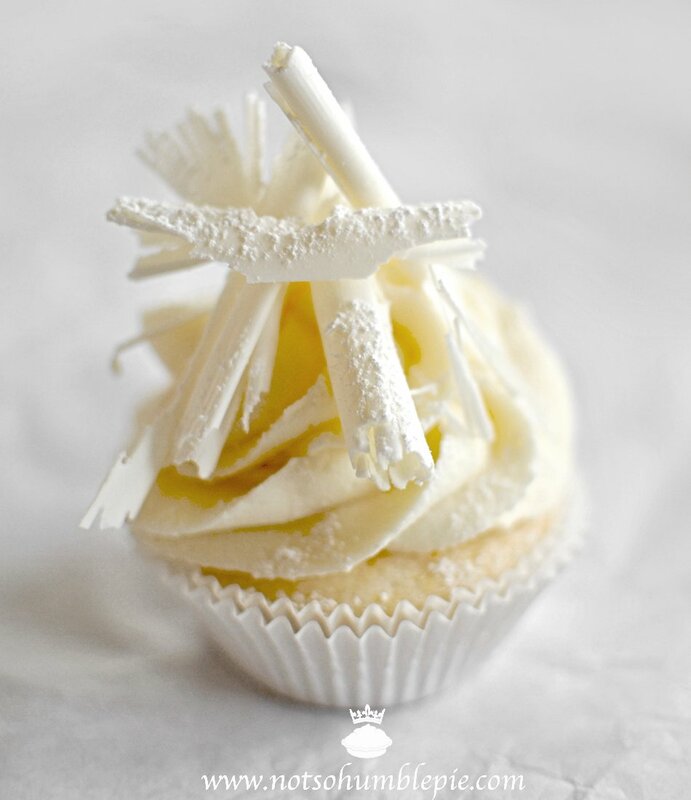 your cupcakes are simply a masterpiece! Hi, I'm new to your website but I just wanted to say your macaron post helped me so much the past few days! They came out perfect! I was also curious as to what kind of camera you used for your photos? They look so vivid.. When I take pictures it looks no where near as nice as yours! I use a dslr.. But I'm afraid my settings are all wrong? Could I have some advice on this too? Made these for Christmas...they were WONDERFUL! Thanks! Ah, YUM is all I have to say ... you go girl! Your cupcakes are gorgeous. You will NEVER be a Sandra Lee. Thankfully. Oh and thanks for clearing up that those were cornuts -- all I heard her say was "acorns" so I envisioned her out there with the squirrels gathering them up. Which, come to think of it, is as it should be. Hello the Humble family. Happy new year to all of you present and yet to be present. I have been following your blog for simply ages now and since cooking for oneself is always a schlep I seldom do but your blog posts always bring a pleasant reminder of days long past when my family was whole and each meal was a delight to prepare. God bless you in 2011. With love and drools, Geoff. I am truly and utterly impressed with you. I just discovered food blogs (yours as the first) and read it from the first post till here.